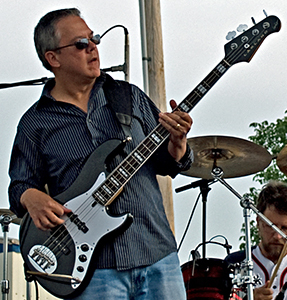 Rick Salvador began playing bass at the age of 10 and has been playing guitar and bass for nearly 40 years. Rick first studied music under the direction of his father, Springfield bassist A.B. (Sal) Salvador, who also played tuba in the Springfield Symphony Orchestra. He studied music theory at Drury College in Springfield MO and has traveled with various groups playing in cities like Kansas City MO and Jupiter FL. Having spent many years concentrating on guitar and jazz theory, Rick now is focused on bass guitar and playing the blues.